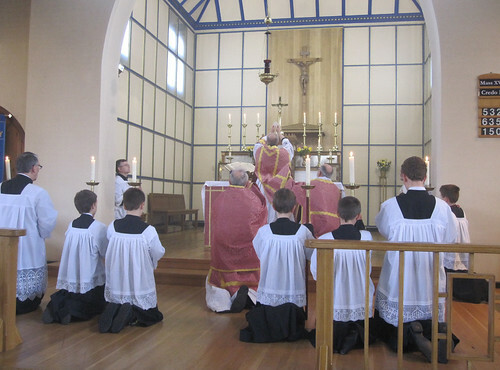 On the Pray Tell blog Paul Inwood has repeated his claim that certain parish priests priests have - wickedly - made their parish's 'principal Mass' a traditional one. ...the question of whether a bishop can step in and say that the vast majority of the flock are being denied what they clearly have a right to, just because of the personal preferences of an individual priest. The answer to that is surely Yes, he can. The instances where a priest has changed the principal Mass on a Sunday morning to EF for a minority, thus forcing OF worshippers (the majority) to move elsewhere, has been disedifying, to say the least. Just for a start, the dioceses of Leeds, Southwark and Clifton have examples where this happened. They are not by any means the only ones. I’m not going to name names because in one case the parish has now been closed down as a result of the ruckus, the priest’s refusal to comply, and the consequent departure of most of the parishioners; in other cases the Bishops asked the priests in question to consider the welfare of the vast majority of their flocks, and they agreed to do so and rescheduled the Tridentine Mass; while in yet others the priest still continues in defiance. It would be wrong to tar them all with the same brush. A number of cases have received publicity on blogs and even in the national Catholic press, so it should not be difficult to identify them if you are that interested. Notice how he backs down from saying that he's talking about 'the principle Mass' to saying that only 'in some cases' it is the principal Mass. He can't substantiate this claim for a simple reason. The Latin Mass Society knows a good deal about the development of the provision of Traditional Masses in the dioceses of Leeds, Clifton and Southwark - and elsewhere of course - and I can say categorically that what Paul Inwood says is false. In not a single case in Leeds or Clifton has the 'principal Mass' been changed from OF to EF, and the claim does not stand up to scrutiny in Southwark either. If Paul Inwood can give us the details I will of course eat my words. If he cannot he should cease from repeating a libel, against the pastoral sensitivity of traditionally-minded priests. He says it would be easy to work out the parishes at issue, because some cases have received publicity. (Why then, is he so shy about specifying them?) In some cases it is indeed easy to work out what he has in mind. But the facts of the cases don't back up his claim. What's been going on in Leeds, for example? 'in one case the parish has now been closed down as a result of the ruckus', says Inwood. We all know what that is about: the sad case of Allerton Bywater, a year ago. Everyone knows that this was a parish in Leeds diocese which provided the Traditional Mass was closed down. You can read all about it on an old post of Damian Thompson's here. Inwood cannot possibly be talking about any other case: I know of no other parish offering the TLM which has been closed down, certainly not with a 'ruckus'. But if Inwood had the smallest regard for the truth of the matter, he would have discovered that the closure of the parish had nothing to do with the fact that the priest offered the Extraordiary Form: it was part of a programme of parish closures - rather a large programme of closures, in fact - and none of the other churches closed down offered the TLM. Did the priest in that parish alienate his parishoners by making the principal Mass on a Sunday a Traditional one? No, Inwood is wrong there as well. The main Mass was at 10am; the parish priest did what most priests do, when they can: he introduced an EF Mass at a new time, in this case at 12noon. So much for the diocese of Leeds. What's been happening in Clifton? In this case, Inwood seems to be relying entirely on his overactive imagination; I am not aware of any public discussion of these issues in that diocese. There are three Sunday TLMs in different parts of the diocese, but NONE of these replaced another Mass: all are in addition to the pre-existing schedule of Masses. So, what's been going on Southwark? Has there been a public fuss about Mass becoming EF there? Well, of course we all know there has been: just over two years ago the synthetic outrage of The Tablet was poured out on Fr Tim Finigan for having a Traditional Mass at a reasonable time on a Sunday: you can read his response here. (The Tablet's long-suffering subscribers can read the original article here.) The Tablet had a large number of mostly laughable accusations, and these included parishoners complaining that they had to go to other parishes or other Mass times to avoid the EF Mass just as Inwood describes, but The Tablet article doesn't mention the question of which Mass time was used for the TLM, and the phrase 'principal Mass' does not occur. The reason for this is simple: they would have been equally outraged whichever Mass time had been used for the Traditional Mass. Here we have a situation faced by a number of priests in parishes with a busy schedule. It is simply impossible to add an extra Mass, partly because there is no time for one at a time people would actually be able to attend, and partly because there is a limit to how many Masses a priest can physically say in the course of 24 hours, even if there is pastoral need for them. So in order to introduce a Traditional Mass on a Sunday, a parish priest has sometimes to use a slot previously occupied by a Novus Ordo Mass. The notion of the 'principal Mass' is often a meaningless one today, because the popularity of different liturgical options (singing of one kind or another) or times (Saturday evening, Sunday evening etc.) mean that in many busy parishes two or three Masses are equally well attended, and there is usally little to distinguish them in terms of liturgical solemnity. Fr Finigan cannot be accused of marginalising the Novus Ordo, and leaving it only some unpopular time, such at 7am: in reality three out of the four 'Sunday' Masses are according to the 1970 Missal, and they continue to flourish, at 6pm on a Saturday, 9am and 6pm on Sundays. It is entirely appropriate that 10.30am, which traditionally would have been the time for the most solemn liturgy in the parish schedule, should be the Sung Traditional Mass. Prior to the change this Mass was not noticably the best attended, which seems to be Inwood's definition of 'principal Mass'. In short, though this might look like the best example for Inwood's claim, it doesn't stand up. 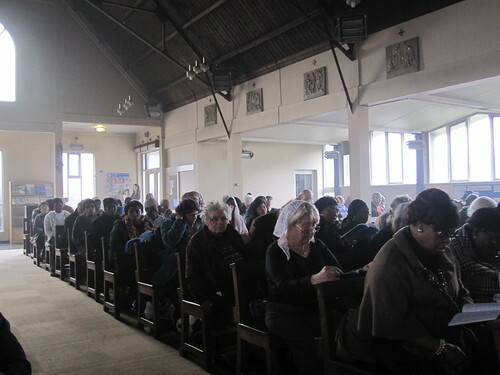 The Blackfen 10.30am was no better attended than the other Sunday Masses before the change. Inwood and his friends have stacked the cards in advance, of course. If priests make a superhuman effort to add to an already busy schedule in order to provide the EF to their parish, they are criticised for saying too many Masses. If they use an existing Mass time, they are criticised for displacing people who don't want what is now offered. But the absurditly of this latter criticism is obvious. It is something which happens all the time: when the style of liturgy at a particular Mass changes, when Masses have to be cut in number, when Mass times are moved around - let alone when churches are closed or parishes merged - for any practical reason, some people will be inconvenienced. Have their rights been trampled upon? Of course not. As a matter of fact many bishops in England and Wales in recent years have been trying to get their parish priests to say fewer Masses, taking the view that priests are wearing themselves out and that there is simply no point in (say) having four half-empty Masses instead of three somewhat fuller ones. Is Paul Inwood enraged by this? Have the rights of parishoners been trampled upon? Of course not. So why is this different? Only becuase it is the traditional Mass. Any stick is good enough with which to beat the priests who are brave enough to exercise their rights, or to accede to the rights of their parishors, in respect of the Traditional Mass. Inwood's special pleading is pathetic, and should stop. I do not know how you can bear to read the "pray tell" blog Dr Shaw. It is profoundly depressing. If you dare to post in disagreement most of the time the comments are removed. As for Paul Inwood. It says everything that he is unwilling to quote Parishes and times.He has his own little agenda. Thanks be to God his type of music is being replace bu music more fitting for the Holy Mass. Would it be too unkind to look forward to the day when Paul Inwood has access to a mass to his linking . . . at 3 o'clock one Sunday afternoon somewhere within a hundred miles? Inwood certainly has form. He lied about the intent of MP when it was originally published, and has continued in the same spirit ever since. It's high time someone cut him off at the knees. could it be that Inwood's wallet is hurting more than his conscience - after all he has made money hand over fist for selling inferior music - all of which would be totaly unsuitable for the EF! Many years ago I was a a so called 'Liturgical Music Day' in Preston where we were charged five pounds for photocopies of badly writtenn ditties (and 20 yrs ago a fiver was a lot of money). So Mr Inwood - wake up and smell the coffee - there IS change afoot - a reform of the reform - where there will be no place for your inadequate music - your money making adys are maybe at an end!! Paul Inwood is certainly right about the principal sunday 10.30 mass being switched to the 1962 missal at Blackfen. There was indeed a backlash among some parishoners who wrote to the bishop and catholic papers, and then changed parishes as a direct result of this. The tablet picked up on this story. I can't see how you can dispute what Paul Inwood says, it has been well documented. He refrains from actually stating which parishes were concerned and only mentions the relevant dioceses but everyone knows where he is talking about. Why can't Paul Inwood do what most of us do - put up with what is offered as worship in his parish church, find a Mass at at a different time or sod off and go elsewhere. In any case, where parishes have a 'sung' principal Mass it is usually poorly attended, as no one is attracted by dreary hymns and if there is a choir, atonal singing without any regard to the liturgy, let alone transcendent beauty. If "everyone knows where he is talking about", is it too much to ask someone to explain to me which parishes Paul Inwood is talking about. Surely I cannot be the only one who does not know. If I might paraphrase the Inwood argument, it would so something like this: "One mid-morning traditional mass on a Sunday is one too many". Inwood's claim is that the principal Mass was changed, and he defines 'principal' as the best attended. It was never any better attended than the 9am and 6pm; immediately before the change to EF it was significantly less well attended. So the Blackfed example does not support Inwood's claim. Are there other cases? Let's see them. I'd be prepared to wager they are as thin as this one. Well written... and thanks for the links to my photos!